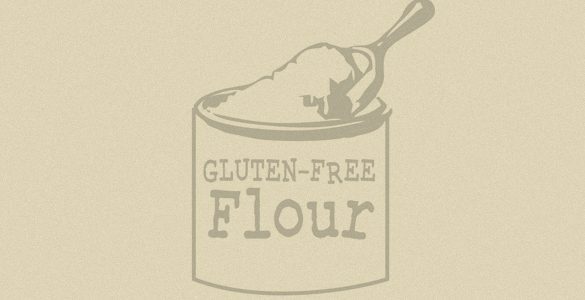 When mixing your own gluten free flour blend, it is very smart to be aware of the different types of gluten free flour and starches on the market. Also, keep in mind the basic ratio of 2 cups heavy flour (includes rice, grain, nut, seed, fruit, vegetable, and bean flours) to 1 cup starch (only five listed). Feel free to play around with some of the heavier flours for optimal taste and nutrition in your favorite gluten free recipes! Brown Rice Flour is stone ground from the rice hull and has a nice nutty taste. It can be used for cookies when combined with other flours, and alone as a thickener or a crispy coating for vegetables, meats, poultry, and fish. This flour contains 2.9 g of protein and 1.8 g of fiber per Â¼ cup. Keep refrigerated for best results. White Rice Flour is ground from polished long- or medium-grain rice and is rich in protein. It will never go bad if stored in a cool, dry place.Â It can be used for cookies, breads, and other yeast-baked goods when combined with other flours, as well as a thickener. White rice flour contains 2.4 g of protein per Â¼ cup. Sweet Rice Flour is made from short-grain, or sticky, rice. It has a higher starch content than white rice flour, and it is a very good thickener or binderâ€”excellent in pizza and breads. It contains 3 g of protein and 1 g of dietary fiber per Â¼ cup serving. Buckwheat Flour is made from buckwheat, which is not related to wheat but to sorrel, knotweed, and rhubarb. It resembles wheat flour in taste and texture and makes great pancakes. Store in the refrigerator to prevent going rancid. In a Â¼ cup serving there are 3 g of fiber and 3.5 g of protein. Millet is made from millet grain and requires a binding agent. It can replace 1/3 of wheat flour in a recipe and has a sweet taste. This flour can be used in pancakes, tortillas, and baked goods when combined with other flours. A 1/3 cup serving yields 4 g of protein. Quinoa Flour is made from quinoa seeds and is high in protein and dietary fiber. The flavor is mild and somewhat nutty, and it lends moisture to gluten-free baked goods. Quinoa flour should be refrigerated, as it has a tendency to go rancid. It is often combined with tapioca, potato starch, and sorghum for use in baked goods. A Â¼ cup serving yields 4 g of protein and 2 g of dietary fiber, as well as over twice the amount of calcium found in wheat. Sorghum Flouris made from sorghum grain and has a long shelf life. This flour has a bitter aftertaste. By itself it can be used in unleavened breads and flat breads, but when mixed with other flours it can be used in baked goods as well.Â Per Â¼ cup it yields 2.4 g of protein and 2 g of fiber. Teff Flour is made from teff grains and is high in protein, fiber, and nutrients. It works well in flatbreads as well as most baked goods when combined with other flours. It contains nine times more iron than wheat and five times more calcium and potassium than cereal grains. There are 4 g of fiber per Â¼ cup. Acorn Flour is heavy and works best as less than half of your flour mixture. It contains 17 g of fat (mostly good fats) and 4.2 g of protein per Â¼ cup serving. Almond Flour is made from blanched almonds and should be stored in the freezer. It can be used in quick bread and pastry recipes, not rising dough recipes. There are 6 g of protein and 3 g of dietary fiber per Â¼ cup serving. It is also a good source of vitamin E, calcium, magnesium, and copper. Almond Meal is ground from sweet almonds and has a consistency more like corn meal than wheat flour. It adds moisture and a nutty taste to baked goods and is good in pastries and cakes. Almond meal contains 28 g of fat (mostly good fats), 6 g of dietary fiber, and 12 g of protein per Â¼ cup serving. Cashew Flour is made from raw ground cashews. It is a good source of antioxidants and can substitute for other nut flours. A Â¼ cup serving yields 2 g of dietary fiber and 10 g of protein. Chestnut Flour is made from dried chestnuts. Its sweet flavor makes it an excellent choice for recipes which call for almonds, chocolate, honey, and/or hazelnuts. It can be used in baked foods and pasta and provides 1 g of protein per Â¼ cup serving. *Note that it may cause an allergic reaction for people with tree nut allergies. Hazelnut Mealis made from ground hazelnuts and has a rich, nutty flavor. It is used in specialty desserts. There are 17 g of fat (mostly good fats), 3 g of dietary fiber, and 4 g of protein per Â¼ cup. Macadamia Meal is made from ground macadamia nuts and has a smooth texture with a buttery flavor. It is equivalent to almond meal and contains all essential and non-essential amino acids. It is an excellent source of good fats as well as a variety of minerals and vitamins. Pistachio Meal is made from pistachios and has a rich flavor. It has a shelf life of six months and should be kept frozen in storage and sifted before use. This flour is particularly good for desserts, as well as a good source of antioxidants, good fats, vitamins, minerals, fiber, and protein. Amaranth Flour is made from the seeds of the amaranth plant. This flour has a nutty taste and works for up to 25% of the flour needed in a recipe. It can be used for pancakes, muffins, and as a thickener. In a Â¼ cup serving there are 4 g of protein and 3 g of dietary fiber, as well as a high amount of the essential amino acid lysine. Chia Seeds are highly nutritious and can serve as an egg replacement when mixed with water or for â€œfirming upâ€ the dough of itâ€™s too wet. They contain more Omega-3s than flaxseed, more calcium than broccoli, and more fiber than beans, as well as being a concentrated source of protein. Chia Seed Flour is made from ground chia seeds and can be used in baked goods and breads when combined with other flours, as well as a thickener. It has all of the health benefits of chia seeds. Flaxseed Meal is made from flax seeds and has a mealy flavor and appearance due to high oil and fiber content. Be sure to put it in the freezer to prevent the oil going rancid. Use like chia seeds and as an additive to smoothies or shakes to increase fiber and protein levels. This meal contains high amounts of protein, soluble fiber, vitamins, essential minerals, omega-3 fatty acids, and beta carotene (important antioxidant). Mesquite Flour is ground from the seeds of the Mesquite tree. Its flavor is deep and rich, comparable to coffee and molasses, and rather strong and unpleasant when used alone. It can serve as a thickener in soups and gravy, as well as an addition to a flour blend. This flour is an excellent source of calcium and magnesium, and it is high in protein and dietary fiber. Pumpkin Seed Flour is composed of ground raw pumpkin seeds. This dark flour has a very nutty flavor and exerts a calming effect when consumed. It can be substituted for almond flour, and it has a high amount of tryptophan, which is an essential amino acid. Coconut Flour is ground from dried coconut meat soaks up water in a recipe very quickly. It makes good cake flour, but is best combined with almond flour. Per Â¼ cup serving, this flour yields 6 g of protein and 12 g of dietary fiber. Corn Flour is made from corn and has a silky texture. It can be used to make pasta, tortillas, and tamales. If enriched, it yields 2.8 g of protein and 1.8 g of dietary fiber per Â¼ cup serving. Cornmeal is also made from corn, but unlike corn flour it has a rough texture. Cornbread, cornmeal mush, and polenta are made using this flour, and it can also be used to coat fish or chicken. There are 4 g of protein and 2.2 g of dietary fiber per Â¼ cup serving. Jerusalem Artichoke Flour is made from dehydrated Jerusalem artichokes to form a heavy flour that does not thicken by itself. It can be used for pasta and bread when combined with other flours. A Â¼ cup serving yields 0.5 g of dietary fiber and 3.5 g of protein. Malanga Flour is made from malanga, which is a root vegetable similar to a potato, and tastes similar to potato flour. It is often sold in Hispanic markets and can be used as a thickener, a substitute for wheat flour in quick breads, and as a coating for dried foods. This flour is high in carbohydrates and easy on people with food allergies. It is also easy on the digestive system. Potato Flour is made from whole potatoes and should be refrigerated after opening. Due to its weight, only a little is needed at a time, and it can be used as a thickener and as a base in many recipes, such as potato soup. This flour is high in vitamins and contains 2.8 g of protein and 2.4 g of dietary fiber per Â¼ cup serving. Sweet Potato Flour (or Yam Flour) is made from white sweet potatoes and is stiff in texture and sweet in taste. It can be used in baked goods and as a thickener. Per Â¼ cup serving there are 4 g of dietary fiber and 3 g of protein. Chickpea Flour (aka Garbanzo Flour) is made from garbanzo beans and is very nutritious with a nice nutty taste. It is used in breads, cakes, and cookies when combined with other flours. There are 12 g of protein and 6 g of dietary fiber per Â¼ cup serving. Fava Bean Flour is made from ground fava beans, has a beany flavor, and is frequently blended with chickpea flour. This flour can be used in breads, pizza, cakes, and cookies. It yields 6 g of protein and 6 g of dietary fiber per Â¼ cup serving. *Note that some people have life-threatening reactions to fava beans. Soy Flour is made from crushed soybeans and is an inexpensive alternative flour. It can be used as a thickener and in baked goods when combined with other flours. There are 7.3 g of protein and 2 g of dietary fiber per Â¼ cup. Also, this flour offers all of the amino acids your body needs as well as good fats. Arrowroot Starch comes from arrowroot tubers and can serve as a thickener for acidic foods and as an addition to flour mixtures for baked goods. It thickens at a lower temperature than flour or cornstarch and does not mix well with dairy products. Cornstarch is made from the inner tissue of the dried corn kernel and has a very finely ground silky texture. It has twice the thickening power of corn flour. Kudzu Starch is made from Kudzu plant tubers (â€œvine that ate the Southâ€). It is very expensive, though it has reputed medicinal benefits, and can substitute for arrowroot powder or cornstarch. Potato Starch Flour is made from potato extract and adds bulk to baked goods. Do not use as a substitute for potato flour and do not let it boil. It can be used as a thickening agent. Tapioca Starch is made from the cassava root. It contributes little nutritional value by itself, but when added to a low calorie soup or combined with fruit to thicken a jelly, the nutritional value of the entire dish can increase. It adds crisp texture to the crust of gluten free breads, as well as structure without grittiness to muffins and cookies.